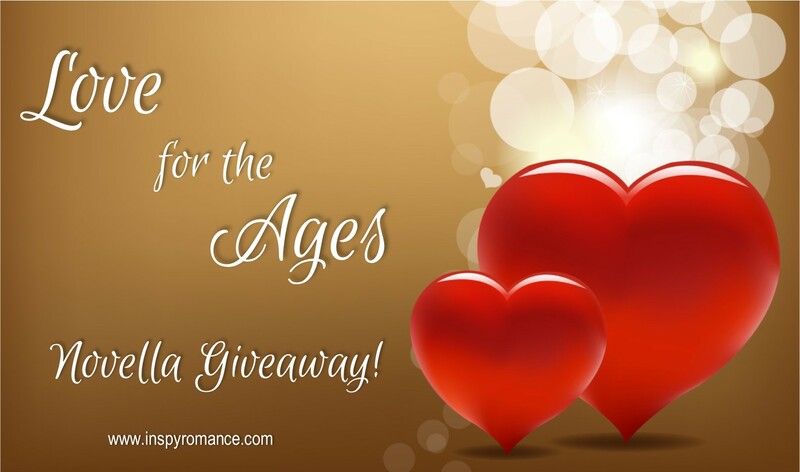 Love for the Ages – Novella Giveaway! As I was trying to figure out what to post about this week, I was skimming my last couple of posts and realized that a couple months ago I mentioned a super secret project then NEVER TOLD YOU WHAT IT WAS ABOUT!!! Oops! ;) So here we go! It’s kind of historical. (shhhh!) Technically, anything after either WWII or Vietnam* is considered contemporary. With that in mind, it does fit our InspyRomance guidelines of contemporary Christian fiction. But it’s set in 1990. In some ways, that feels REALLY old. Almost 30 years in fact! It’s the story of King Benjamin’s parents. He’s the hero of my most recent release, The Indentured Queen. Even before that, it’s well established that his parents completely adored each other. This is their origins story as it were. So I thought I’d share a snipped and let y’all decide if it should be considered historical or not ;). And feel free to join my mailing list and grab your own copy for free. For a first date, she experienced very little of the awkwardness unlike the first time she went out with any other guy before Alfred. But he was different. They didn’t run out of anything to talk about. They laughed. He touched her hand as they talked. He told her about his younger brother and sister. Eliana told him she had a brother, but not much about him or the rest of her family. Just as they finished eating, she caught a glimpse of Mary rushing through the room. Alarm coursed through Eliana. “What is it?” she asked as Mary stopped at their table, her hands on her knees as she tried to catch her breath. With his hand on the small of her back, they rushed through the student union café. They couldn’t get to the hospital fast enough. “Turn right at the second light.” Eliana swiped at a tear. Whatever was going on, he hoped he’d escaped campus without the paparazzi noticing. They had an agreement. As long as he remained on campus or at official university functions, he was off-limits. There had been much grumbling about how much time he spent within the hallowed confines of the campus. In fact, this was only the second time he’d left in six weeks. The first time, only a couple of photographers saw him grab a pint with Edward and a few mates. He was over eighteen. It was legal in Auverignon, but it still drew much criticism. He’d only had one even. The bag phone in his car rang while he sat at a light. It was Thor, checking in and finding out where he was headed. The light changed. “Yeah. My parents pay for it in case someone needs to get a hold of me.” More so his security could get in touch with him if their cars got separated unexpectedly. “It’s kind of cool.” Eliana picked up the whole bag and twisted it around as Alfred came to a stop at another light. “Just go straight. You can drop me at the front.” Her dark hair hung like a curtain blocking her face from his view. “Nonsense. I’m not going to leave you alone until you’re with your family.” And maybe not even then. He didn’t want her to be alone. That’s the end of Chapter 1 and beginning of Chapter 2. What jumps out at you as “not quite contemporary”? I’ll share my thoughts in the comments later today. Want to find out what happens? Newsletter subscribers should have gotten a link in the last two newsletters. Not a subscriber? You can sign up by clicking here. New subscribers should have one in their welcome email. Before she was the queen mother, Eliana Robertson was just a young woman studying at an Auverignonian university. Then she met a prince. Crown Prince Alfred of Eyjania knew he wanted to marry Eliana the moment he saw her, but even though he knows they’re meant for each other, it can’t be that simple. 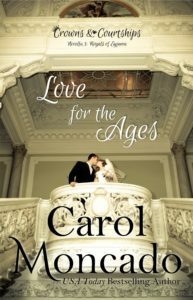 A scheming brother, a sister who thinks she knows best, and a mom who would give anything for her daughter to be queen all make it difficult for Alfred and Eliana to discover if they really do have a Love for the Ages. *Depends on who you talk to, but that’s kind of the generally accepted guidelines. I love hearing about new books and authors. Thanks for the giveaway. Hi, Carol! I cannot believe 1990 is nearly 30 years ago! Boy that makes me feel old, lol! Thanks for sharing this story, it sounds wonderful. I have loved your Royal series, and look forward to more! Hi Carol, I enjoyed this story:) Hmm, for me the novelty of having a mobile/car phone struck me as ‘old’ hehehe!! Hi Carol! Thanks for sharing. I love your royals series. Best wishes and enjoy your week. I enjoyed reading the back story of Benjamin’s parents and how it enhances the series! Thank You! this sounds like it would be a great story. being a prince , having a Mobil phone in the car both strike me as being on the old side. I have been totally infatuated with your books. Being a full time tea her, mother, church musician and private piano teacher my life has been far too busy to have leisure time to read. Since retiring 8 years ago I’ve wanted to get into reading as a means of relaxing and finally can. Your books are wonderful, interesting, and captivating . I suppose being inquisitive on the life of royal families as well as being a Sucker for a sweet romantic story done tastefully contributes to my desire to not put your book down till I finish! Thank you for these wonderful stories and the pleasure they bring. I’m so glad I stumbled on Love For the Ages” that got me hooked!! Keep em coming please! I loved reading this story. It really helped me when I read King Benjamin’s story. Eliana is so down to earth, tender, and non-assuming. She just makes the best royal! I also loved how she helped Benjamin in his marriage. The cell phone is the not quite contemporary thing that jumps out at me. She’s surprised he has one. Love the chapter you shared. Can’t believe it’s been almost 30 years since 1990, lol. Although cell phones were around, they didn’t have the coverage they do now. Thank you for sharing. Sounds like a really good read. Thank you for the chance. I really enjoyed this story. If there is a phone in the car its contemporary! 1990 seems recent to me. Lol. The bag phone. I’d forgotten about those. Hey all!!! So sorry I didn’t stop in yesterday!!! It was on my schedule then two kids were trying desperately to finish summer homework, a dog had an… incident, the normal day before school starts stuff, and a bunch of other stuff until I finally collapsed in bed wo making it. Ugh! I didn’t write any words either :p.
I’m inclined to agree that a phone not attached to a wall automatically makes it a contemporary ;). Works for me! Thank you so much for the awesome giveaway Love all paperback books and love meeting new authors Thank you for The Back To school Bash!